Jason White may not be an official member of Green Day, but his contributions are huge. Ever since Warning he has been lending a helping hand to Green Day so that they can make the awesome music so dearly loved by fans. 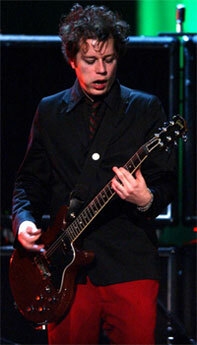 Jason White was born on November 11th, 1973 in the wonderful town of Little Rock, Arkansas. Jason is heavily involved in the record label Adeline, which most of you know as Billie Joe and Adrienne's label. He is the co-owner and is also in bands signed to Adeline. Jason and Billie Joe are both members of the band Pinhead Gunpowder, in which Jason plays guitar. Jason has been touring with Green Day since the album Warning and even helped them record American Idiot as second guitar and backing vocals. Aside from bands with Billie, Jason was also a member of the band Chino Horde, which is a very significant band in the Emo music scene. He was in this band until 1993, but they broke up after that for personal reasons, which was a good thing for Jason because it allowed him to expand musically. Jason’s next band was formed with another member of Pinhead Gunpowder, Bill Schneider. They also asked Bill’s brother Greg to join the band, along with Willie Samuels, and formed a band known as the Influents. Greg and Jason were the main vocals and song writing duo of this group. Their debut album, Check Please, was featured in the iconic rock magazine, Rolling Stone, on the top five Artist Picks list. After the release of this album, Bill left the band to go work and manage his drum shop, but there were no hard feelings, and he was replaced by Johnnie Wentz. Jason’s band then released their second and final album, Some of the Young.They then toured with the album, and finally broke up afterwards in 2003. Different ideas on the direction of the band and other personal reasons are the cited cause of the split. Although Jason White is not an official member of Green Day, he can be found in three of their videos. He has his own platform in the Wake Me Up When September Ends video and he is the guy who is making out with his girlfriend in the When I Come Around video. Also, in Jesus of Suburbia video, when footage of Milton Keynes Is flashing, Jason White can briefly be seen. After the American Idiot Tour, Jason returned back to Little Rock, Arkansas and hopped aboard yet another project with his side band The Big Cats. Jason joined this band in 1997, after the death of a member. This band really isn't that serious and rarely plays, but is currently recording an album and plays a few shows throughout the recording process. The release date of this album is unknown, but is guessed to be somewhere in late 2006. Jason White is also married to a woman named Janna, who is a wonderful girl who makes him very happy. Also, in The Network's DVD Disease is Punishment, there is a certain character known as Balducci. Balducci plays a shockingly similar role in The Network as Jason White does for Green Day. He offers second guitar and backing vocals in concerts. I’m not saying Jason White has any relation to the Network, nor am I implying that The Network has any relation to Green Day. I’ll let you draw your own conclusions on that subject. An article discussing Green Day's involvement with the Instant Karma organization. What's It Like Riding with Boys? Article about the song The Saints Are Coming.